"The king sized bed was very comfortable." Have a question for Wyndham Garden Lake Buena Vista Disney Springs Resort Area? "The resort is very welcoming as you walk into the lobby." "The Wyndham Garden was chosen because of it's proximity to Disney Springs." "Love the location of this hotel and the rooms are clean with..."
Magic abounds at this official Walt Disney World® Hotel. Located directly across the street from Disney Springs™, a world-class entertainment, shopping, & dining district, this beautiful resort specializes in family-friendly amenities and uncompromising fun and service. Now through 2019, hotel guests have access to exclusive Disney benefits including the Extra Magic Hours program and 60 Day FastPass+. As part of the Extra Magic Hours program, each day select attractions are open longer at one of the Walt Disney World® Theme Parks. The ability to reserve Disney FastPass+ attractions up to 60 days before you arrive is another exclusive benefit. Best of all, it is included with valid Theme Park admission – at no charge. As an added bonus, continuous transportation is provided to the four Disney Theme Parks daily and the hotel’s LakeView Restaurant plays host to a Disney Character Breakfast every Tuesday, Thursday, and Saturday mornings. Kids of all ages love the Oasis Aquatic Pool Playground, an exciting focal point of this family-friendly resort featuring two pools, interactive water features, and a large hot tub. Adults can relax on the beautiful pool deck while enjoying great food and refreshing beverages from the Oasis Bar & Grill. Each of the hotel's 394 tastefully appointed guest rooms are located in one of the hotel’s two 5-story buildings. All guest rooms feature exterior entrances, plush bedding, Wi-Fi, flat-screen HDTV, mini-refrigerator, and an in-room safe large enough to accommodate a laptop. 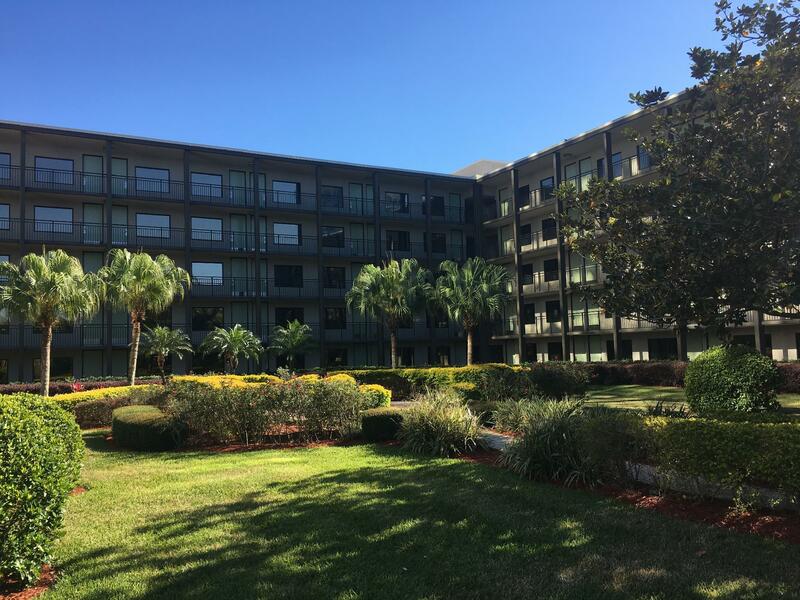 Whatever your purpose of visit, Wyndham Garden Lake Buena Vista Disney Springs Resort Area is an excellent choice for your stay in Orlando (FL). "The tower area is beautiful and feels very safe." I was very disappointed when we arrived to the resort for check-in that it was another $245 for parking/amenities. We have been staying at the same resort for the last 4years and every year the price goes up about $100. Great value property, excellent pool and laundry facilities. Very friendly and helpful staff. Walking distance to Disney Springs and Crossroads shopping mall so plenty of dining options on offer. Only cons - room was quite small and the buses to Disney parks were not that frequent and had to change at the Transit Centre. But still, a free and smooth service so can’t complain. We stayed across the street at another hotel for a business conference for one week and then needed to find an additional night close by. The Wyndham had a great rate and was very convenient. A 2 minute walk to Disney Springs, it is far enough away to find peace and quiet from the chaos of Disney. The pools and lounge chairs were great, and staff were helpful. On-site dining options were limited. WiFi worked well, even in pool areas, and the parking rates were reasonable. Good value for money. 5 veteran student and myself were attending a conference at Coronado Springs, upon being able to book our room we found that the rooms at Coronado Springs was booked. Wyndham was on the list of close hotels so we booked. Upon booking I asked if the Magical Express made its way passed Coronado Springs and I was put on hold and transferred twice. As advised, we ended up renting a car. Once we arrived and checked in, I was told that we could catch the Magical Express at Disney Springs which was under a 5 minute walk. I feel as though employees of the hotel should have held this knowledge and would have saved us the expense of the car. I have stayed at Disney multiple times and did not find the customer service to be of Disney status. I would refer the hotel if someone was looking for a less expensive alternative but to ensure they do their research regarding surrounding parks and ask questions about the resort. You cannot go wrong with this Resort! Directly across the street from Disney Springs, which isn’t a long walk. The resort is very welcoming as you walk into the lobby. The staff are great! The rooms are clean, the carpet in the rooms doesn’t make your white socks brown, the bathrooms are clean and nicely maintained. If your given a room in the 1032 to 1040’s request alternates. Those numbers are ground floor on the loading dock and dumpster side. It gets quite noisy at 4 a.m. But other than that, you’ll enjoy the resort! We’ve stayed here several times over the years, never had a bad experience. The picture of the hotel is very misleading! It shows you the "new" TALL hotel; but got booked in the older part of the hotel. Valet was VERY overpowering as soon as we pulled up. We were very tired from driving and had never been to your resort. He was just doing his job- I'm sure- but he was very pushy and not real, real polite. Big turnoff! Expensive for what you got, pool doesnt close til 11pm so children yelling and screaming. Smokers allowed to smoke on pool deck, i myself dont smoke so did not care for that. Only used pool area 1x because of it..Walking distance to alot of stuff.. Clean.. Beds comfortable..
Love the location of this hotel and the rooms are clean with comfortable beds and pillows. The pool area is nice just wish it stayed open later. Friendly and helpful staff. My second stay there and won’t be the last. The king sized bed was very comfortable. But the shower heads are very old and some days the hot water would to stay hot and other days It was perfect. Also, you can hear anybody who walks by outside. Footsteps and bags echo into the room. And when the people next door check in at midnight with a bunch of screaming kids. It's a bit annoying. And the pool seems much bigger in the pictures. But other than that. Being so close to Disney springs was awesome. 5 minute walk and your there. And being able to access any of the Disney resorts from Disney springs bus loop is awesome too. We had a good stay. And it was a good price for 6 nights. Resort fees are stupid expensive. 25 a night plus 15 a night to park if you bring a car. Definitely location and transportation are just as good as staying on Disney property. Only down side was the mattress was uncomfortable a the ice machine didn’t work on our floor. Excellent value. Perfect location. Staff are fantastic; from greeting when we arrived until we left every encounter we had with a hotel staff member was fantastic. Highly recommend this hotel as a great place to stay for a Disney vacation. I stumbled upon this place for a great deal. Since my husband and I were only staying for two nights we didn't want to spend a fortune. The room is with a king bed was just perfect enough for us to sleep and shower in. Our visit was more focused on hanging out with family in Disney. The hotel is in walking distance to Disney Springs and buses make stops at the hotel for the other Disney parks. There is a nice large pool area with a bar, a self-gated parking lot, a cafe, etc. The hotel is also close to other businesses outside of Disney. The Wyndham Garden was chosen because of it's proximity to Disney Springs. It is an easy walk--with an elevator and walkway over the busy highway and right down into Disney Springs. I was here mostly to spend time working with my computer on financial reports---so it is nice to take a break and a walk down into DS for lunch, dinner, or a movie. The location right off I-4, makes it easy to get to. There is a separate fee for parking your car, but it is a secure lot. Our room had a balcony with the door opening outdoor to the balcony, so if this is not your thing, you may look for alternatives. Unfortunately our week had temperatures in the 30's at night, so it was a cold week for Orlando and DS....but you can buy a light weight down jacket at UniQlo for a low price---and keep yourself warm! The beds were comfy---and with all the walking--I always had a sound night's sleep. Our room was great, the beds were so very comfy! We enjoyed our stay for the most part. The only issue we had was getting roped into taking the Timeshare tour. We were told it would only be 90 minutes, but we were there for 5 hours! We lost half a day! The people didn't have much care that my sister had to leave to take her diabetes medicine, they offered her juice and kept us there for another 40 minutes. I was so livid with the Wyndham reps. They claim no pressure and to be ethical...there was A LOT of pressure and the fact they wouldn't let us leave to get her medicine was not exactly ethical. We stayed here for one night and then moved Disney Caribbean Beach Resort. Wish we had stayed at Wyndham!!! The Wyndham has a great location and facilities, helpful staff and even have luggage carts which our Disney hotel did not. I liked the staffs, I was unsure of the informations I got from the first staff, so I asked another staff and he told me more than I got before. It was my first time to be in a place with parking fees. It was 12 dollars per night, FYI. And I wish the time available for the outdoor pools were little bit longer, since the Disneyworld visiters come back to the Hotel at the latest 11pm. Maybe until the 12am would do. Else, it had great atmosphere. I would visit again. This was a great place to take the family on our recent Disney trip. The convenience to Disney Springs was great for meals that we didn't eat in the park. The only thing we struggled with a little was finding the best transportation to the parks. Location of property was very good, able to walk to Disney Springs. Overall the property was very clean, rooms were comfortable. Staff was accommodating, my grandson locked something in the safe and they were able to get it out for us without any hassle. I would definitely stay at this property again! This is a great place to stay if you have young children. It's been recently renovated and while there were some small annoyances (bathroom faucet aerator needed changing, and carts rolling thru halls were noisy), they were nothing compared to the fun you will have. There are two pools. One is a large lagoon like pool with a big rock/waterfall feature and a zero entry water play ground. There two areas with steps for kids to play or adults to sit and they are spacious. The deepest water depth is approx 1 M. The other pool is an adult pool with no water features and it's deeper. There is a spa, but we didn't use it. There were plenty of chaise lounges and also some cabanas for rent. Additionally, there was a vendor with inflated pool toys for sale/rent. There is a full bar and some food service. We ate at the restaurant and it was surprisingly good. The hotel has bus service to Disney parks which is very convenient. Disney Springs (formerly Downtown Disney) is a short walk and there are plenty of restaurants and shops and even a few small rides for the kids. If you're going to be doing the parks and don't want a pool, stay somewhere else/cheaper. Our stay was for three days, Fri to Sun. We spent Fri at the Magic Kingdom and Sat/Sun at the pool. It was a great mini-vacay! The kids want to move here. Great location, just a few steps away from disney springs. It wasn't a fancy place but it was way more than we expected for the price we paid. Out onyl real concern was that we ate at their restaurant twice and our kid got sick both times. We stopped eating there and everything was fine. We didn't get sick ourselves.